Oil on canvas, 35 x 55 cm. A pair of Venetian gondolas are in the process of rowing out to the Church of San Giorgio Maggiore, which rises majestically over the Canal Grande alongside the Church of Santa Maria della Salute. Some of the city’s locals can be seen standing about the entrance to the church, while in the foreground a company of tourists are taking in the view. Like his colleague Anton Melbye, Carl Neumann belonged to the internationally oriented movement within Danish marine painting and made several trips abroad. 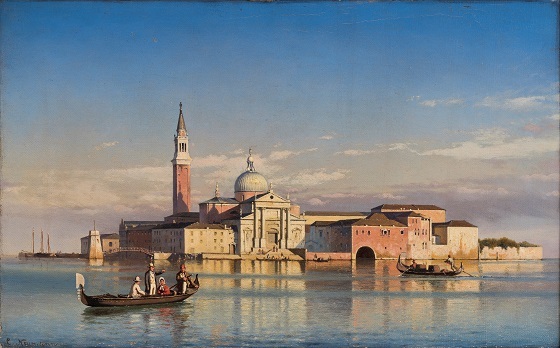 In this painting from his stay in Venice, the artist appears to have been interested in capturing the special Mediterranean daylight, as well as its dynamic interaction with the glassy surface of the canal’s waters and the city’s magnificent architecture. The shadows cast by the buildings creates a dream-like interplay between cold and warm shades, while an almost golden colour palette dominates where the surface of the water meets the faint reflection of the sun-crowned Church.